Dragons and Dungeon Dwellers Beware! * Luck defined as a new ability score with several options for incorporating it into your games. * A complete toolbox for building your own variants of the core races, while also giving guidelines for building planetouched races, half-races, and greater races. * Six new base classes, including the eldritch weaver, spellmaster, and thanemage. Epic progressions are also inclucded for each class. * New uses and modifiers for skills based on creature types body types, and a selection of new feats like Fighting Withdrawal and Taunt. * An all-new numeric alignment system, with examples for creatures found in the MM. * Mass combat rules, fully compatible with Malhavoc Press' Cry Havoc. * Over 100 new spells, like crown of valour, foozle, and the devastating ring of fire. * The psychic base class, and the skill- and feat-based psychic system first presented in Green Ronin's popular Psychic's Handbook. * Engaging illustrations from top artists like Toren "Macbin" Atkinson, Drew Baker, Kent Burles, Storn Cook, Marcio Fiorito, Jonathan lKirtz, James Smith III, Joseph Wigfield, and Lisa Wood. 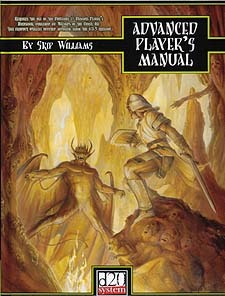 Written by the d20 guru and sage Skip Williams, author of the MM, the Advanced Player's Manual is the perfect sourcebook to take your games to the next level.